The Wyoming Massacre… The name, for 200 years, conjured images of rampaging Iroquois warriors slaughtering Americans. As they did. But the massacre came when the Iroquois and a contingent of Loyalist Rangers routed an American militia force in battle. The Indians did not slaughter non-combatants; they simply took a bloody toll of a defeated, panicked, demoralized enemy force. On July 3, 1778, Maj. John Butler’s Loyalist Rangers and Seneca auxiliaries inflicted this bloody defeat on American militia in Pennsylvania’s Wyoming Valley. The Valley was a breadbasket for General Washington’s continental Army, and as such an attractive target for the British and their Indian allies. Butler lured the American militia toward his force, bidding the Seneca warriors to hit the dirt to remain hidden from view. The militia made no attempt to reconnoiter the Rangers’ positions and were unaware of the hidden force of warriors. After the Americans fired three ineffective volleys, the Rangers fired and charged from a range of about 100 yards, and the Senecas sprang up on the militia’s front and flank and engaged the enemy in hand-to-hand combat. The terrified Americans fled, which only made them more vulnerable. The rangers took three killed and eight wounded, while taking 227 scalps and the defenses of the Wyoming Valley. Notably, no non-combatants were harmed, though the Seneca did torture prisoners to death. 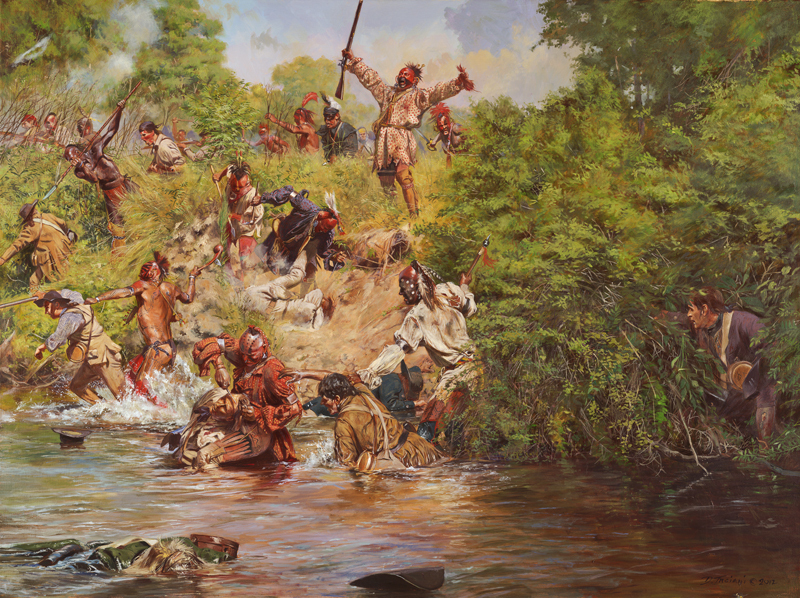 Only a handful of Americans escaped the carnage, as depicted in Don Troiani’s painting. The massacre prodded Washington to dispatch a column under Gen. John Sullivan in 1779, which systematically destroyed Iroquois villages, impoverishing the people and effectively breaking them as a significant military force, though warriors continued to raid through the end of the Revolutionary War. A friend of mine actually gave me a t-shirt commemorating this battle, with an image of the monument on it. Interesting to learn more about it. Thanks for stopping by Roscoe. Couldn’t agree more.